You know those fantastic videos you see of a brand-new motorcycle ripping on the racetrack, road or off-road? Well, they really look amazing, and most of the times we see them and believe that the bikes featured in them are amazing because we see them doing spectacular things. But shooting a promotional video isn’t easy, and the marketing guys from Triumph and the stunt riders Nick “Apex” Brocha and Ernie Virgil discovered this the hard way! The new Triumph Street Scrambler was revealed last week at INTERMOT Cologne, but all the photos and promotional videos were done before, so we, the journalists, could show you all the fantastic details that the new Street Scrambler has. One particular video was done by Triumph backed stunt riders Nick “Apex” Brocha and Ernie Virgil. 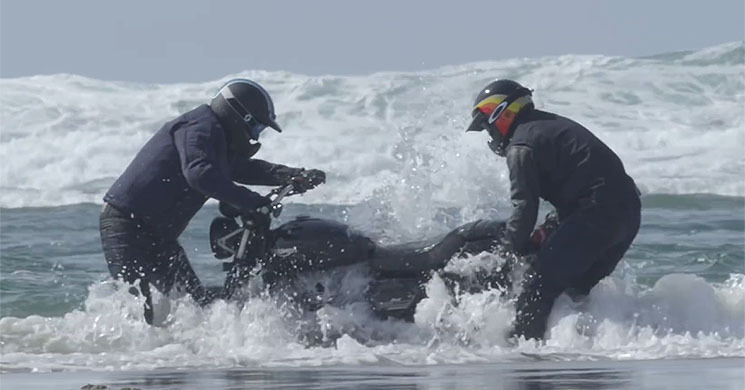 Using the Street Scrambler off-road, they took the bikes for some beach riding and fun time, but Virgil took it too far and found himself stranded at the beach break, with the bike falling to its side and getting all that salt water inside the engine. Both riders had to make the best of the situation, and after a few oil changes, they’ve returned to action and finished shooting the promotional video for Triumph. This is a cool behind the scenes video you can’t miss!